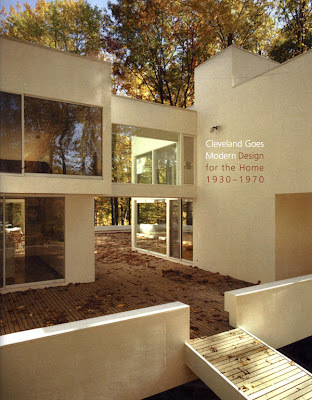 I've been wanting to review Cleveland Goes Modern: Design for the Home, 1930-1970 for quite some time. The book, published by the Cleveland Artists Foundation in 2007, documents what they believe to be the best in modern residential architecture in the greater Cleveland Area. An essay on mid-century modernism by Ted Sande provides some context to the architecture illustrated in the book. Six architects receive more in-depth looks at their work: Don Hisaka; John Terence Kelly; Robert A. Little; William B. Morris; Ernst Payer; and Fred S. Toguchi. Eighteen others receive brief overviews, a third of a page in length. An essay, by Henry H. Hawley, on decorative arts during the same period contributes to a better understanding of the aesthetic of the architecture. Generally, I agree with the residences chosen for inclusion. The Agnes Gund residence, designed by Don Hisaka, which graces the cover, is stunning. So is Hisaka's own residence, which I featured back in December. Similarly, John Terence Kelly's McDonald residence deserves to be here, as does the Harold Burdick residence. There are some issues with the title. It only includes architect-designed homes, so structures like the Ferro House, in South Euclid, are excluded. They played a significant role in the exploration of new materials that mid-century modern came to embody. The book also only includes houses that were still standing at the time of publication. One that we've lost, which would have been worthy of inclusion was the house that Ernst Payer designed for Peter Lloyd on South Woodland in Moreland Hills. The biggest flaw, however, was the failure to include the addresses of the houses. When we talk about historic sites, we need to be able to talk about where they are. Further, historians need to know where structures are to know if they are still standing as well as to talk about historical context. There is a remedy to this oversight. This PDF is a two page appendix that should have been published with the book. It lists the addresses for every house pictured in Cleveland Goes Modern. With this addition, I highly recommend Cleveland Goes Modern. 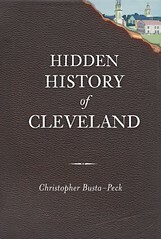 It presents and interesting perspective on a period in Cleveland residential architecture that has not been previously addressed. The photographs illustrate interiors of many homes that I'll never be able to see - heck, given these locations, there are many that I won't ever even be able to see the exteriors of in person. While I don't agree completely with the decisions and choices, it's more a matter of academic disagreement than actual flaws. Cleveland Goes Modern: Design for the Home 1930-1970 was published in 2007 by the Cleveland Artists Foundation. 48 pages. ISBN: 978-0-9799739-0-1. It may be purchased from the CAF store or in person at CAF, at Beck Center, in Lakewood.